In the midst of current debates about the accessibility of public spaces, resurfacing as a result of highly visible demonstrations and occupations, this book illuminates an overlooked domain of civic participation: the office, workshop, or building where activist groups meet to organize and plan acts of political dissent and collective participation. Author Nandini Bagchee examines three re-purposed buildings on the Lower East Side that have been used by activists to launch actions over the past forty years. The Peace Pentagon was the headquarters of the anti-war movement, El Bohio was a metaphoric "hut" that envisioned the Puerto Rican Community as a steward of the environment, and ABC No Rio, appropriated from a storefront sign with missing letters, was a catchy punk name that appealed to the anarchistic sensibility of the artists that ran a storefront gallery in a run-down tenement. In a captivating discussion of buildings and urban settings as important components of progressive struggles in New York City over more than a century, Bagchee reveals how these collectively organized spaces have provided a venue for political participation while existing as a vital part of the city's civic infrastructure. 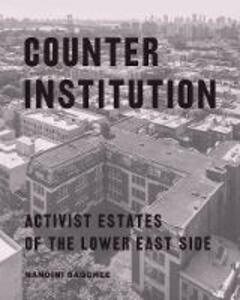 The "counter institution" explored in this book represents both a conceptual and a literal struggle to create a space for civic action in a city that is built upon real estate speculation. The author reveals the fascinating tension between the impermanence of the insurgent activist practices and the permanent but maintenance heavy aspects of architecture. The actors she vividly describes-the war resisters, the Puerto Rican organizers, the housing activists, the punks and artists-all seized the opportunity to create what are seen as "activist estates," at a time and in a place where urban life itself was under attack. And now, when many such self-organized "activist" buildings are imperiled by the finance-driven real estate market that is New York City, this book takes stock and provides visibility to these under recognized citizens' initiatives. Counter Institution is an innovative work that intersects architecture, urban design practices, and geography (cartography) on the one hand, with history, politics, and sociology on the other. It is a must-read for anyone interested in the history of activism in New York City and how the city can inspire and encourage political engagement. Through its beautifully illustrated pages-where drawings, maps, timelines, and photographs underline the connections between people, politics, and space-readers will discover new ways to imagine buildings as a critical part of the civic infrastructure and a vital resource for the future.